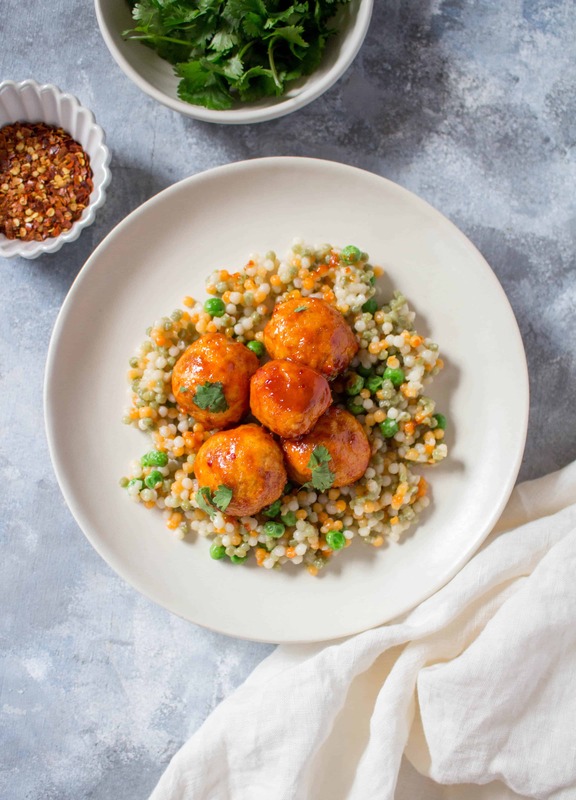 These Tteokbokki Inspired Korean Meatballs are going to change up the way you eat meatballs! 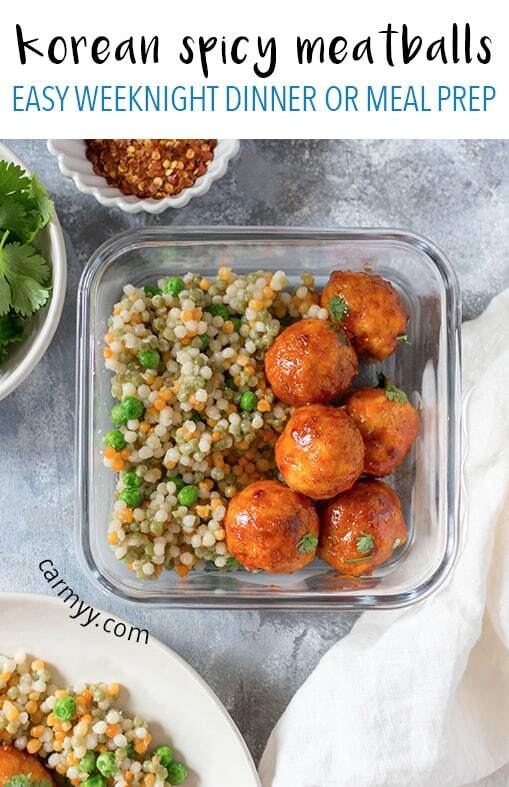 Great as an easy weeknight dinner or as a meal prep. Guys, I’m sure you’re bored of me saying how much I miss Korean food (ahem, H hurry up and come home so I can order 5 things off the menu and we can “share” them) but I really miss tteokbokki! We made some great memories eating tteokbokki both here at home and in Korea. I still have a little chuckle whenever I think back to our friend Kate who forgot the name of the dish so she made a little cylinder hand motion to indicate what she wanted. So this week, since I now own a 1lb bag of Korean chili powder, I spent a morning testing our sauces to see if I could recreate that tteokbokki sauce. 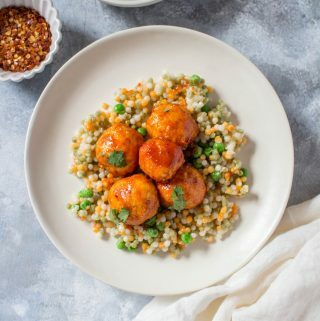 This meatball dish is inspired by tteokbokki as I’ve recreated the sauce to go onto of meatballs instead of the traditional rice cake and fish cake that it is usually served with. Tteokbokki, pronounced duk-bok-kee, is a delicious chewy bite-sized rice cake dish is stir fried and then tossed in this spicy but sweet Korean sauce. It’s a very popular street food item as well as served in restaurants. Note: I still remember how much more spicy tteokbokki was in Korea than it was in Canada! I had to dash over to the juice stand beside the tteokbokki stand and practically threw my money at the man to get some juice because my mouth was on fire! 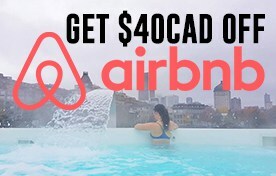 #WorthIt. While the oven is heating, mix together the salt, pepper, garlic powder, onion powder, paprika, panko, parmesan cheese, egg, and a drizzle of olive oil together and then mix it into the ground chicken. Do not over mix. Shape the meatballs (I used my little cookie scooper to portion out my meatballs so they’re the same sized to make sure they cook evenly). 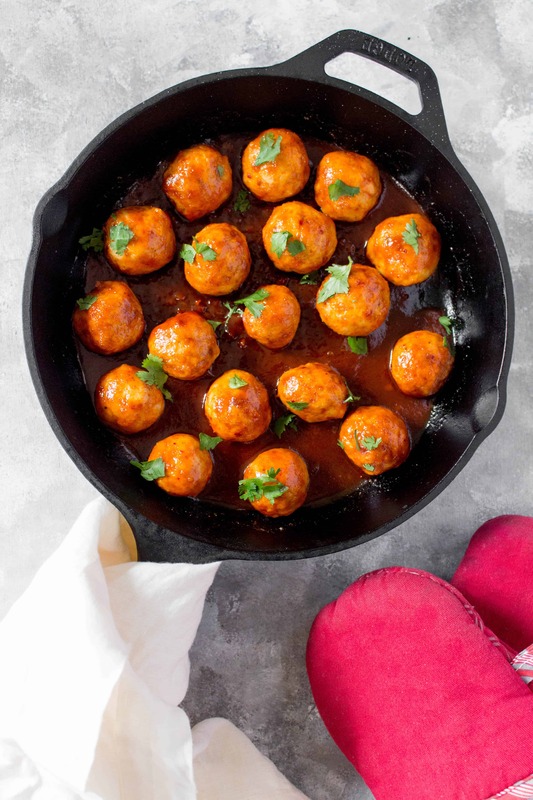 As your meatballs will get denser as they cook, avoid overpacking/over-rolling your meat. 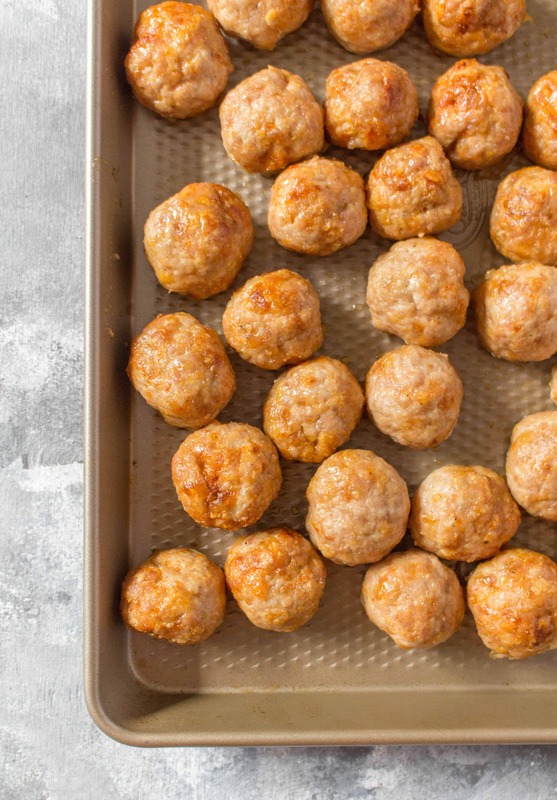 On a sheet pan, place a piece of parchment paper or spray with non-stick, then place your meatballs on the sheet pan without over crowding them. Pop them into the oven for around 17 minutes or until they’re cooked through. Once the meatballs are cooked, in a pan, pour your sauce mixture in and add the meatballs. Coat the meatballs with the sauce and let everything simmer for 3 minutes. The olive oil in the meatballs help keep them moist as well and prevent the ground chicken from sticking to your hands while rolling. If it’s sticking, coat your hands in olive oil before rolling again. If you want to make this into a freezer meal, you can freeze the meatballs on their own and whip up the sauce when you’re ready to eat. In a large bowl, mix together the salt, pepper, garlic powder, onion powder, paprika, panko, parmesan cheese, egg, and a drizzle of olive oil together and then mix it into the ground chicken. Do not over mix. Want a free downloadable shopping list and recipes for one week's meal prep (lunches and snacks)? Sign up now for updates and get your shopping list and recipes today! Is there another spice I can use that is not so hot as the two you show, but still authentic Korean spices? This looks amazing and I don’t want to make it without any seasonings in the sauce. Thank you! Hey Jeanne, thank you for your comment. 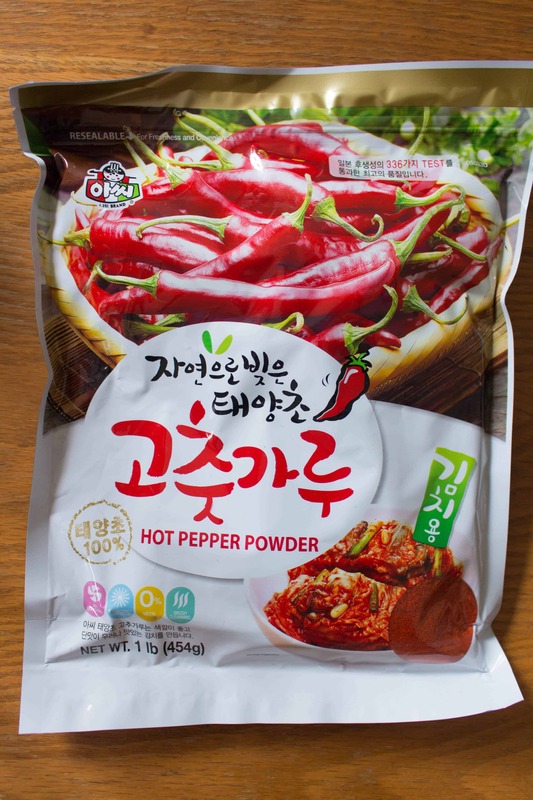 I cannot recommend a different spice as this is what is used to make tteokbokki. 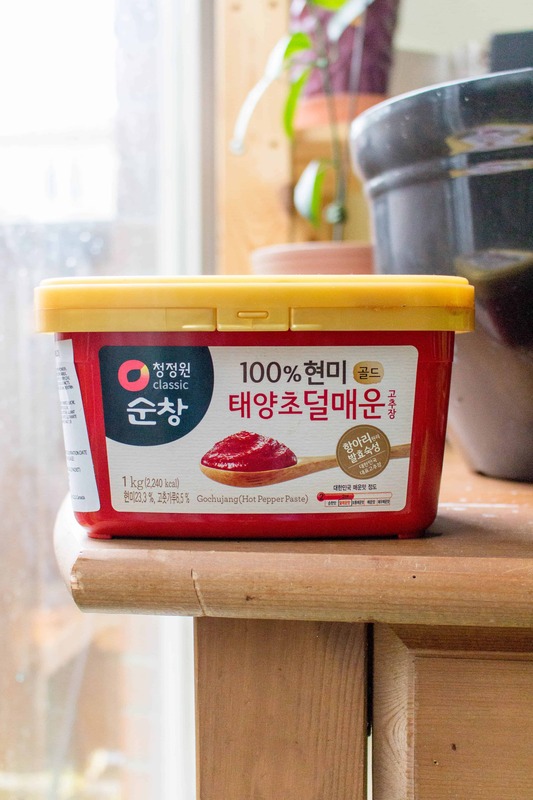 I’m not 100% sure but to my understanding, there are gochujang pastes that are less spicy on their own (they have a little temperature indicator or number on the container). If you are still concerned about the spice level, I suggest increasing the amount of brown sugar and decreasing the amount of hot pepper powder to cut down on the spiciness. Also, you could just make less of the sauce to coat the meatballs so the meatballs themselves will be more prominent than the sauce. I haven’t tested this recipe with my suggestions so I cannot say with confidence how it’ll come out. Please let me know if you have any questions or if any issues arise! 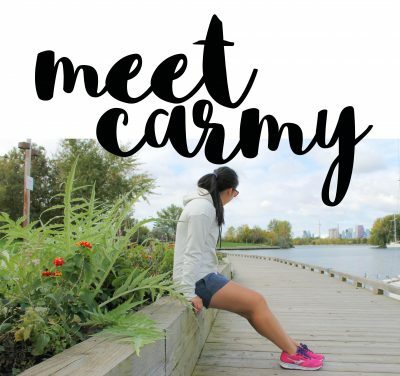 Carmy is a healthy-ish living blogger based in Toronto. 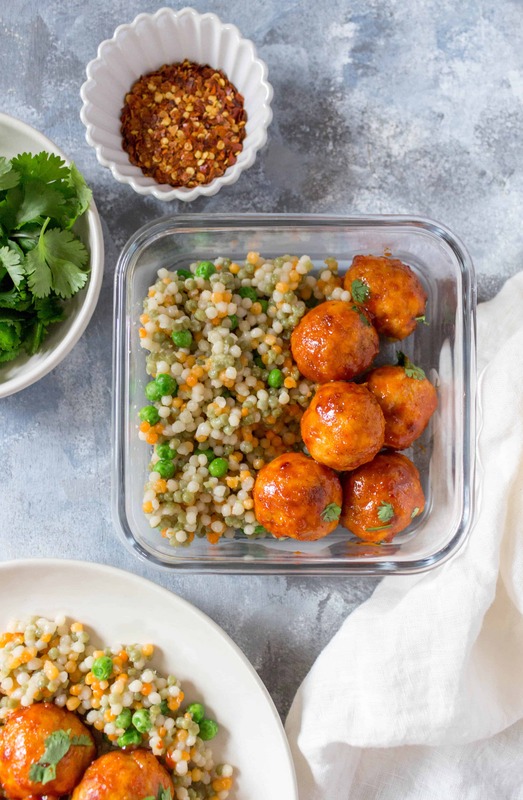 Here you can find healthy-ish meal prep recipes, Instant Pot recipes, and lightened up family favourites! Follow along on as she shares what she learns along the way! Visit her about me page to learn more about her. Click here to check out her Meal Prep: Learning the Basics ebook. Sign up for updates and get a free downloadable shopping list and recipes for one week's meal prep (lunches and snacks) AND a weekly meal planner printable to help you plan! Want a free downloadable shopping list and recipes for one week's meal prep (lunches and snacks) plus a weekly meal planner printable? Sign up now for blog updates and get your shopping list, recipes, and printable today!